Director of the Billion Real Estate Holdings Limited Mr Eddy Tsang Man-chung (second from right) and Partner of the Billion Real Estate Holdings Limited Mr Gary Chan Lap-wai (first from right) present a cheque of HK$3 million to the OUHK. Council Chairman Mr Michael Wong (third from left), Deputy Chairman of the OUHK Council Mr Silas Yang Siu-shun (second from left), and President Prof. Yuk-Shan Wong (first from left) receive the cheque on behalf of the OUHK. Guests officiate at the plaque unveiling ceremony of the "Billion Charity Fund Physical and Mechanical Testing and Certification Laboratory". Group photo of officiating guests and staff of the OUHK. 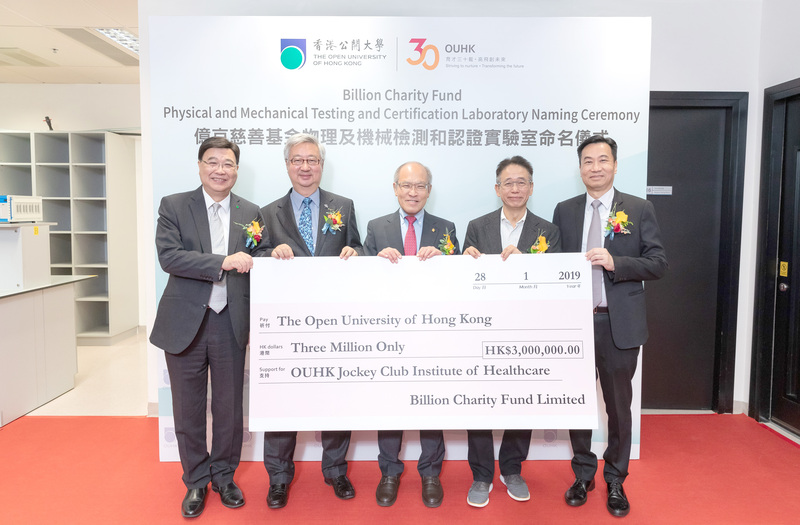 The Open University of Hong Kong (OUHK) has named a Physical and Mechanical Testing and Certification Laboratory at its Jockey Club Campus after Billion Charity Fund Limited (the Fund), in recognition of the Fund's generous gift of HK$3 million towards the development of the University's new Jockey Club Institute of Healthcare. The Naming Ceremony held today (28 January) was officiated by Director of the Billion Real Estate Holdings Limited Mr Eddy Tsang Man-chung, Partner of the Billion Real Estate Holdings Limited Mr Gary Chan Lap-wai, Chairman of the OUHK Council Mr Michael Wong Yick-kam, Deputy Chairman of the OUHK Council Mr Silas Yang Siu-shun, and President of the OUHK Prof. Yuk-Shan Wong. 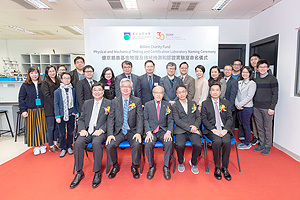 Speaking at the ceremony, Mr Michael Wong Yick-kam expressed his deepest appreciation to Billion Charity Fund for its generous contribution and unfailing support. He commended Billion Real Estate Holdings Limited for their work of giving back to the community. The enterprise donates a substantial amount of money to various local and overseas charitable organizations through Billion Charity Fund Limited every year, offering tremendous help to people in need. Mr Michael Wong said the donation received would be used to fund the construction of the new OUHK Jockey Club Institute of Healthcare. 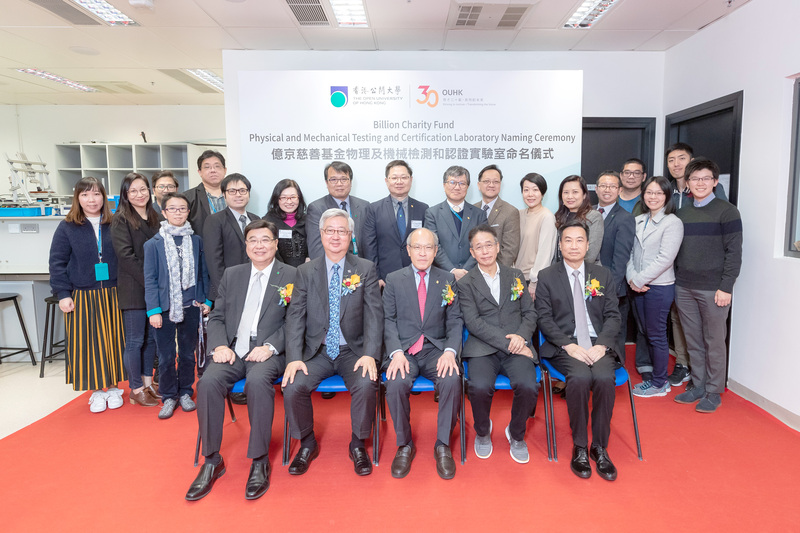 "The new Institute not only allows us to improve the teaching and learning environment for our students, but will also bring long-lasting benefits to the Hong Kong society," he said. The new campus will be home to a suite of nursing and healthcare-related programmes to cope with the future manpower needs of the community. It is expected that about 2,800 students will be benefited from the new learning facility every year upon its completion in 2020. 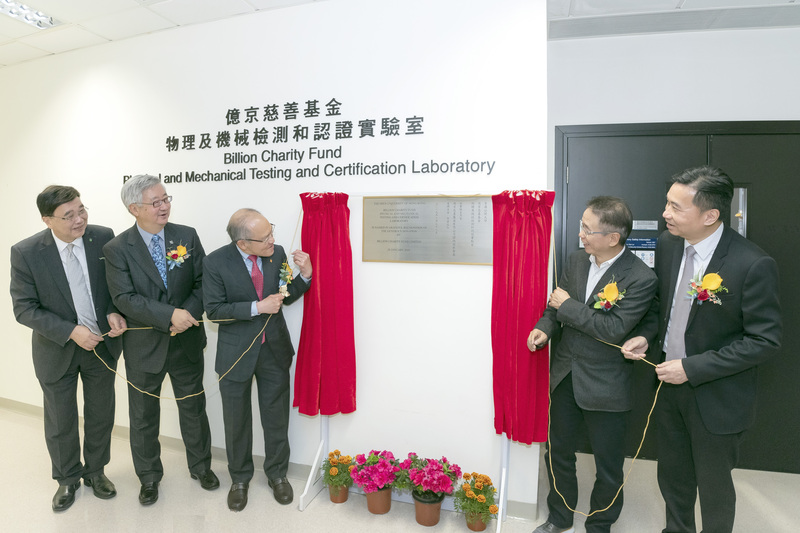 The "Billion Charity Fund Physical and Mechanical Testing and Certification Laboratory" is located on 10/F of the OUHK's Jockey Club Campus with a total area of about 200 square meters. The cutting-edge Laboratory is designed and operated in accordance with International Standard ISO/IEC 17025. It is equipped with state-of-the-art facilities such as the acoustic chamber, instruments for sound measurement and universal tester for testing material. Students of the Testing and Certification programmes will be able to learn and develop hands-on skills from the various electronics and testing devices available in the Laboratory. The OUHK has been officially appointed as the assessment agency to conduct Prior Learning Assessment for practitioners in the Testing, Inspection & Certification Industry since 2015. 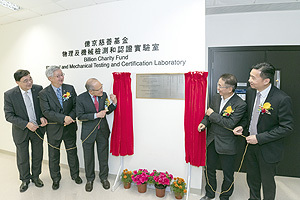 The Laboratory has been used to conduct related assessments to facilitate the professional development of the Industry in Hong Kong.